Falabella horses origanted in Argentina and was developed by an Irish settler named Patrick Newell. Mr. Newell came across a group of horses that were freely roaming the open land. He created a herd and over time went on to give the herd to his son-in-law, Juan Falabella. The breed gained their name from this family ownership and passed down from generation to generation in the Falabella family. They were designed to be horses that were small enough to be enjoyed with children, but independent enough to help on ranches and even be used as work horses. 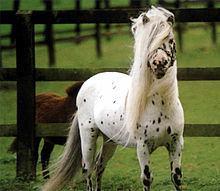 Falabella horses are used for riding, in competitions, and for showing. They do very well on large farms and in smaller, fenced-in areas as pets. They are gentle and very well mannered with families. Falabella horses are around seven hands high. They are muscular for such a small animal and have boxy hooves. Additionally, they have silky hair and very fine skin. They have small feet but are still described as a hardy creature. They are found in virtually any color coating, but patterns and spotted variations are the most popular.